Marketing leaders will find evolutionary shifts in demand and supply for their multichannel marketing initiatives. The inaugural MMH Magic Quadrant examines a market unifying customer data across channels, enhancing personalization and decisioning with AI, and integrating customer journey analytics. Gartner defines the multichannel marketing hub (MMH) as a technology that orchestrates a company’s communications with and offers to customer segments across multiple channels. These include websites, mobile, social, direct mail call centers, paid media and email. MMH capabilities also may extend to integrating marketing offers/leads with sales for execution in both B2B and B2C environments. Basic multichannel marketing includes functionality for segmentation, campaign and message creation, campaign workflow, and campaign and message execution. Advanced analytic functionality enables customer-level data and analysis and modeling such as predictive analytics, journey analytics and customer profile management. Advanced execution functionality includes personalization, content management, event triggering and real-time offer management in both inbound and outbound environments. Digital marketing capability, as part of an integrated multichannel marketing solution, includes functionality for programmatic advertising, mobile and social marketing, and web and email marketing. Digital marketing extends the marketing process through channels such as the web, email, video, mobile and social applications, point-of-sale terminals, digital signage, kiosks, and the Internet of Things (IoT). Marketers have spoken and it’s clear: data, how its managed, integrated, enriched and activated matters more than ever before. 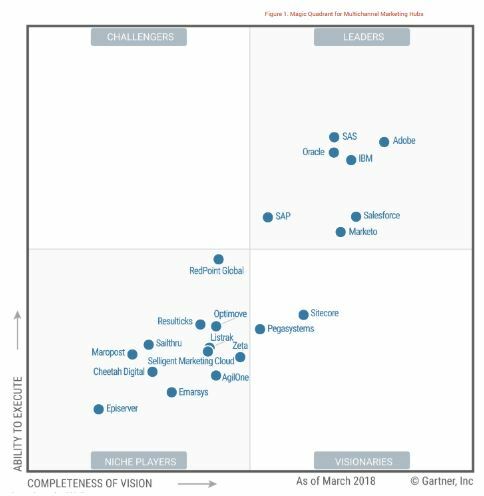 Oracle achieves a place in the leaders quadrant thanks to the proposed solutions that are based on a comprehensive infrastructure and a wide range of applications. Connected customer data across the entire marketing and Customer Experience platform has been a strategic focus for Oracle. Oracle has a comprehensive underlying data infrastructure. Its multichannel marketing hub includes a range of capabilities and marketing applications, and has a comprehensive underlying data infrastructure. Product. B2B and B2C marketers seeking deep customer centricity, a foundation for AI and the ability to orchestrate a unified customer experience should consider Oracle’s solution. Oracle believes strongly that B2B and B2C marketers have unique and different needs, in fact Oracle is the only vendor who has focused on providing marketers with individual best of breed solutions for each with an integrated platform of complementary solutions. Oracle segments its multichannel hub functions to specialize in B2B (Oracle Eloqua) and B2C (Oracle Responsys) for upper-midmarket and large enterprises. The connected assets of the Oracle Marketing Cloud enable horizontal integration into other offerings such as Oracle Bluekai, Oracle Maxymiser and Oracle Infinity Analytics. This approach is fundamentally different from other vendors who seem to be selling a marketing cloud “El Camino” as the only vehicle you need – but it isn’t a very good car and it isn’t a very good truck. New capabilities. In 2017, Oracle enabled the integration of Oracle Data Cloud attributes throughout the Oracle Marketing Cloud offering, using applications with a common ID graph to map first-party data to second- and third-party data for audience insight and acquisition. Marketers gain capabilities such as Responsys Program Orchestration to trigger display media retargeting campaigns. Oracle strengthened its Adaptive Intelligent Apps, its ability to use machine learning to gain customer insights and recommended actions. Roadmap. Oracle’s 2018 plans include CX Audience, a cross-channel and cross-platform segment creation tool that ingests event and consumer attribute data from across the enterprise. B2B marketers using the Eloqua suite gain a LinkedIn Sales Navigator app that delivers native insights from social selling activities. Oracle also plans to launch a Salesforce CRM app, as well as enhanced auditing capabilities for objects within the Oracle Marketing and CX offering. “Being a leader, of the ‘Leaders’ is particularly flattering considering how important this emerging category is to our customers, partners and employees.” said Austin Miller – Director of Product Markting at Oracle.